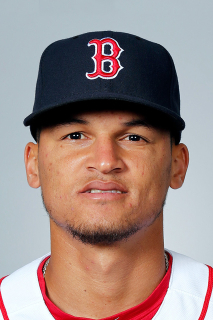 Anyelo Gómez does not have any MLB stats for the season. Combined to go 5-3 with a 1.92 ERA (15 ER/70.1 IP) and nine saves over 38 combined appearances, one start, at Single-A Charleston, Single-A Tampa, Double-A Trenton and Triple-A Scranton/Wilkes-Barre…Opponents hit .198 (51-for-257)...Was a Florida State League Mid-Season All-Star...Started the year with Charleston, before a promotion to Tampa on 5/8...Moved to Trenton on 6/22, where he made his lone start of the season... Finished the season with Scranton/WB, making one perfect relief appearance of 2.0 innings...Made four postseason appearances for the RailRiders, tossing 5.1 scoreless innings...Selected by the Braves with the seventh pick of the 2017 Rule 5 Draft on December 14. December 13, 2018 Pawtucket Red Sox claimed RHP Anyelo Gomez off waivers from Scranton/Wilkes-Barre RailRiders. September 24, 2018 Scranton/Wilkes-Barre RailRiders activated RHP Anyelo Gomez from the 7-day disabled list. May 6, 2018 Scranton/Wilkes-Barre RailRiders placed RHP Anyelo Gomez on the 7-day disabled list. April 27, 2018 Scranton/Wilkes-Barre RailRiders activated RHP Anyelo Gomez from the 7-day disabled list. April 18, 2018 Scranton/Wilkes-Barre RailRiders placed RHP Anyelo Gomez on the 7-day disabled list. March 20, 2018 RHP Anyelo Gomez returned to New York Yankees from Atlanta Braves. March 20, 2018 RHP Anyelo Gomez assigned to Scranton/Wilkes-Barre RailRiders. December 14, 2017 Atlanta Braves claimed RHP Anyelo Gomez off waivers from Scranton/Wilkes-Barre RailRiders. September 1, 2017 RHP Anyelo Gomez assigned to Scranton/Wilkes-Barre RailRiders from Trenton Thunder. June 22, 2017 RHP Anyelo Gomez assigned to Trenton Thunder from Tampa Yankees. May 8, 2017 RHP Anyelo Gomez assigned to Tampa Yankees from Charleston RiverDogs. March 21, 2017 RHP Anyelo Gomez assigned to New York Yankees. October 20, 2016 RHP Anyelo Gomez assigned to Gigantes del Cibao. July 17, 2016 RHP Anyelo Gomez assigned to Charleston RiverDogs from Staten Island Yankees. September 1, 2015 RHP Anyelo Gomez assigned to Charleston RiverDogs from GCL Yankees1. August 5, 2015 GCL Yankees1 activated RHP Anyelo Gomez from the 7-day disabled list. May 17, 2015 RHP Anyelo Gomez assigned to Tampa Yankees from DSL Yankees1. May 30, 2014 RHP Anyelo Gomez assigned to DSL Yankees1 from DSL Yankees2. November 20, 2012 New York Yankees signed free agent RHP Anyelo Gomez to a minor league contract.